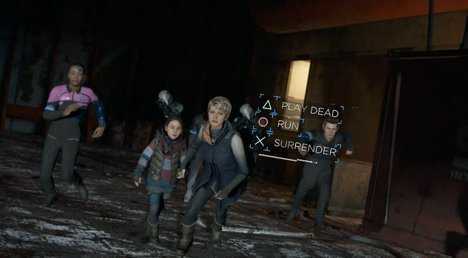 After a cutscene showing the police arriving at Jericho, control will shift back over to Kara. You’ll have to run with Alice and follow Luthor through the different halls of the Jericho ship. The SWAT are killing androids in different areas, so following Luthor will help avoid them. Make sure you stick to the paths that Luthor goes to, otherwise you won’t make it out of the area. Eventually Luthor will get shot. 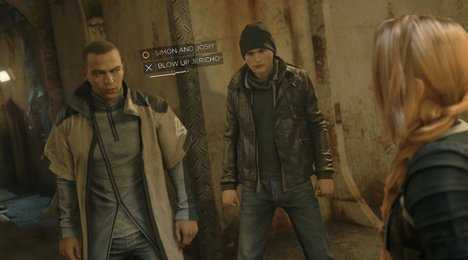 Control switchs over to Marcus, where he and Connor will meet up with Rose. You’ll have a series of choices to make for the dialogue. Go through each option first before you choose BLOW UP JERICHO. You need to do the other options beforehand to send out a message to other androids and learn about Simon and Josh’s wearabouts. When you can control Marcus again, begin running through the halls towards the marked off point in front of you. You’ll have to dash through the area and avoid the crowd. Eventually when you go downstairs, Marcus will meet up with an android before you have to run through the area again. Continue running to the marked off point and avoiding those that block your path. The bridge will break and Marcus will fall down to the ground. A short cutscene will play out showing more events happening, before control then switches over to Kara. You’ll be given a choice to help Luthor out or leave him and protect Alice. Pick the option to HELP LUTHOR and hit the button prompts as they appear. Another cutscene will play and then you’ll have to run out with Alice. Continue through the corridors and hide in the first door you come across. When inside, you’ll be given a choice to open the door when you hear someone crying out for help. Open the door and a guard will try to break through and kill Kara. Hit all of the prompts that appear to avoid being killed and fend off the guard, which will play another scene through. You’ll then shift over back to Marcus. Hit the prompt to leave and avoid the guards as you sneak around the corridors. 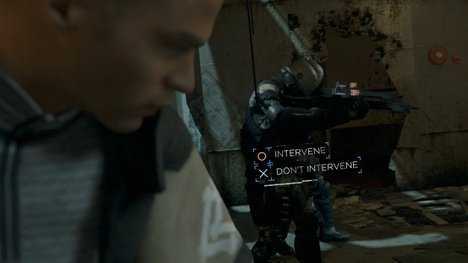 When you come across a group of androids about to be executed, make the choice to INTERVENE and hit the prompts to fight the SWAT. If you’re successful, you’ll save the androids and can continue moving around. Keep moving to the waypoint and you’ll come face-toface with a shield SWAT. When you have a choice to fight or flee, make the choice to CLIMB the wall on the left and avoid fighting the SWAT. 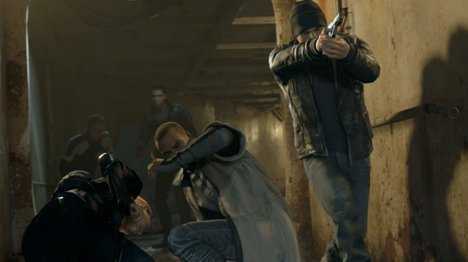 As you move forward, another group of androids will be attacked by the SWAT, which you can save or leave to be. Afterwards, continue moving forward and you’ll go down the stairs to find Josh being attacked. INTERVENE and help save Josh by fighting the SWAT. After a short scene, control will then shift back over to Kara and Alice. When you regain control of Kara and Alice, you’ll have to run away from the SWAT killing more androids. When you get knocked down and have to make a choice, pick the option to PLAY DEAD. This will cause Alice and Kara to hit the ground, you’ll be given another choice here where you’ll need to pick DON’T MOVE. NOTE: Choosing any other options here other than PLAY DEAD and DON’T MOVE will cause both Alice and Kara to get killed. If that happens, you won’t be able to get the Good Ending of the game. 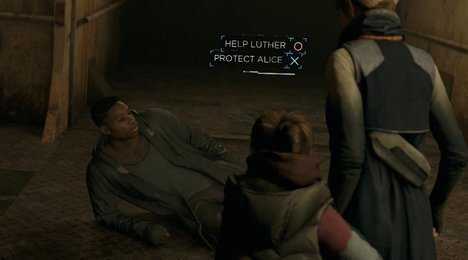 After another cutscene plays and shows Kara and Alice escaping, you’ll then regain control of Marcus. Hit the prompts as they appear to fight off the SWAT. Afterwards, hit the promt that ppears again to activate the bombs inside Jericho. Next, start running through the halls and hit the button prompts that appear to jump over obstacles and keep running. When North gets injured, you’ll be given an option to save her or leave her. Pick the option to SAVE NORTH and you’ll have to hit another few button prompts to fend off the SWAT. After a brief scene, Connor will appear and fight off the SWAT team. Hit the button prompts to survive the attack and fend off the SWAT. Another cutscene will play out and lead right into the end of the chapter. Copyright © 2014 - 2019 SocksCap64, All Rights Reserved. Logos, Trademarks, Pictures Belongs To Their Respected Owners. Powered By WordPress. 65 Queries in 0.396 seconds.